If you noticed a few more law enforcement people than usual here in DC today, good eye. 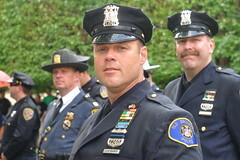 Police detachments from all over the US are going to be in DC this week for National Police Week. Thursday is the early arrival day before the big candlelight vigil at the National Law Enforcement Officers Memorial in Judiciary Square, but a memorial service is set for 11am today. Yesterday’s 16th Annual Law Ride ended at the memorial site. Starting Friday, there are a series of events at the FOP DC Lodge (2nd & H St NW), as well as an Honor Guard Competition, a Pipe Band demonstration and other festivities.